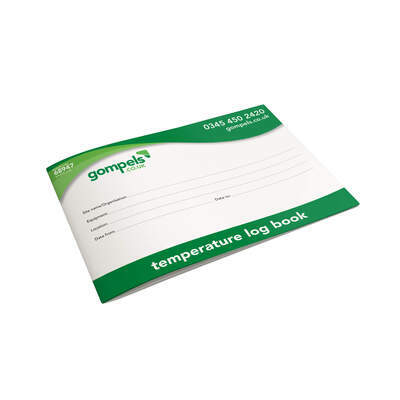 A handy way to ensure your equipment is working effectively, our Temperature Log Book A5 can be used in a range of environments. Specifically, in commercial kitchens, each fridge, freezer or cold cabinet should be accompanied by a log book to keep track of the internal temperature on a regular basis. Our version contains 52 individual pages allowing it to spread across an entire year. Each page has been printed with dedicated fields for information including the temperature recorded, the time of day, a signature from the reports and any actions that need to be taken. In addition, this temperature log features a thermometer calibration log which works to ensure you are taking the most accurate result. Here at Gompels, we have a wide range of Thermometer to suit your needs. With everything from our Super-Fast Mini through to our Digital Fridge and Thermometer option, all of our products work within your budget.